Wall Street Oasis (WSO) released a detailed 2017 Investment Banking Report that includes data on compensation, the interview process, employee satisfaction, and more. All statistics featured in the reports are based solely on paid user submissions to the WSO Company Database during 2015, 2016 and YTD 2017, with approximately 70% of the submissions coming from the United States. In addition, the investment banking industry made its voice heard by supplying almost half of the 50,000+ submissions, followed by an approximately 20% representation by Asset Management. This data is high quality and statistically robust.Main categories are analyzed below with an emphasis on most relevant employers and key points of interest. Key Observation 1: First-year analyst total (base & bonus) compensation averages $121,000 with associate level rising to $218,000. The total average compensation, including base salary and bonus, for bulge bracket banks ranges from $121,000 annually for a first-year analyst to $377,000 for a director-level position (small sample size). The first-year analyst compensation has increased slightly from $114,000 in 2015 to $121,000 in 2017 as has the associate compensation from $211,000 in 2015 to $218,000 in 2017. The salaries along the continuum of career advancement remained consistent between bulge bracket banks and boutique banks since 2016, with the exception of a significant increase in pay for the vice president level at $457,000 annually among boutique banks, albeit with a smaller sample size. Unlike bulge bracket banks, the top compensated positions at boutiques have remained steady over the past several years. An interesting finding in this investment banking report involves the correlation between career advancement and percentage of bonus in overall compensation figures. Notably, Bank of America/Merrill Lynch far exceeds the average director-level compensation with a figure of $415,000 annually (but interns get less). BAML has risen consistently over the past three years, and broke into the top 3 last year. JP Morgan Chase, on the other hand, has been declining over the past 3 years - falling from first in 2014/2015 to fourth in 2017. PJT usually pays a much higher bonus (~$87k) than the average ($43.9k), which is why it is in the top spot. Moelis and Rothschild have also consistently given top compensation over the past few years. In aggregate, investment banks typically lose out to other industries on intern pay, however. Overall, employees at Houlihan Lokey, Bank of America/Merrill Lynch and Citigroup were most satisfied with their pay compared to similar jobs elsewhere. The exponential increase in comp from analyst to director. Data up until October 2017. This is in comparison to other industries like consulting where starting salary is around $80,000 base and rises to $320,000 at the director level. At an average technology company, software engineers' base starts at around $75,000 but is capped at $271,000 as directors. Key Observation 2: Centerview Partners, PJT Partners, Moelis & Company and Evercore are viewed as having the hardest interview process. Member submissions also provided information on the interview process, including the hardest and best experiences. To compile the statistics, each company is given an adjusted score using Bayesian estimates, which takes into account the number of reviews for a particular company with a minimum of two required. The results are representative of 135 firms.Earning the reputation as having the hardest interview process are Centerview Partners, PJT Partners, Moelis & Company, and Evercore. This is not too surprising since these firms are all considered elite boutique investment banks with incredibly competitive recruiting processes. PJT, while a newcomer, spun out of Blackstone in 2015 and is following in Blackstone’s tradition of being in the top five for hardest interview process. The other three also had consistently difficult interviews from 2014-2017. The best interview process reviews go to Harris Williams & Co., Perella Weinberg Partners and PNC Financial Services. Each of these investment banking firms also increased or maintained its ranking compared to the 2016 WSO Investment Banking Industry Report. 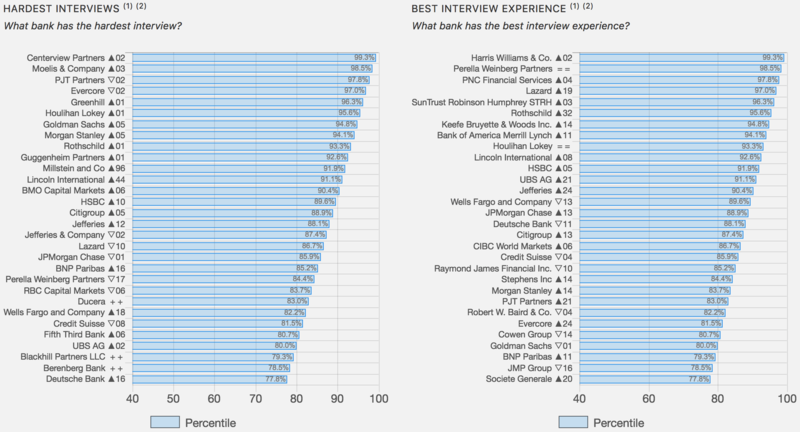 Hardest Interviews and Best Interview Experience, listed by banks’ percentile. Data up until October 2017. Key Observation 3: Industry leaders in the professional development category correlate with the total compensation category but not with the interview process rankings. The professional development section of the 2017 Investment Banking Reports focuses on the four sub-categories. We’ve highlighted the top 3 out of 79 firms in each sub-category. It is interesting that Wells Fargo has quickly risen to becoming the top company in terms of Professional Development (compared to 2014-2016), considering its fraud press. It may be possible that Wells Fargo is devoting more resources to employee satisfaction and growth after the scandal, but is something to watch going forward. Interestingly, top investment banks in these categories correlate with the total compensation category but not with the interview process category. In addition, the top three investment banks for intern offer rates have no correlation with compensation or interview process listings. Some of the investment banks with top full intern offer rates are detailed below: Intern Offer Rates, listed by offer rate. Data up until October 2017. 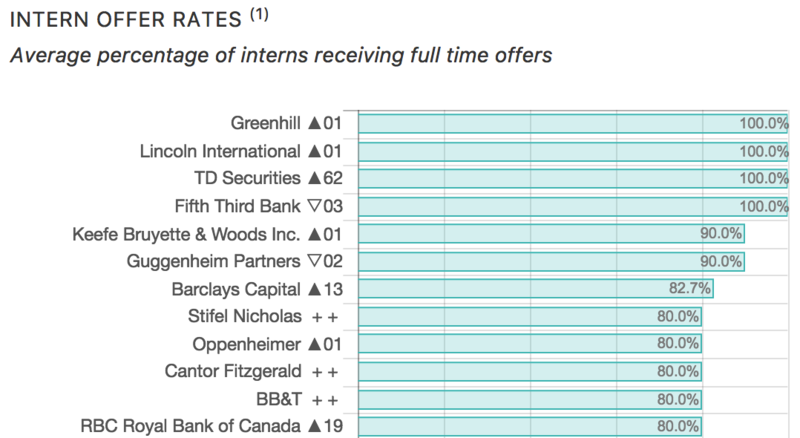 See 30 banks with the highest intern offer rates on the full report. Key Observation 4: Goldman Sachs was the sole investment banking firm in the top three in each sub-category. Member submissions also shed light on promotions and fairness in Investment Banking. Again, we’ve highlighted the top firms in each sub-category. Notably, Goldman Sachs was the sole investment banking firm in the top three in each sub-category, with Houlihan Lokey a close second. This is an impressive accomplishment in a field of 79 firms represented in the report. Promotions and Recognition listing, by investment bank. Data up until October 2017. Key Observation 5: Goldman Sachs and Bank of America/Merrill Lynch have the proudest employees and would be recommended to others by their employees. Perhaps the most important evaluation of a company is what its employees say outside of work. In this report, reputation is defined by two factors, employee pride and whether employees would recommend the company to others. Not surprisingly, top performers noted throughout the 2017 Investment Banking Reports were also top performers in this category. 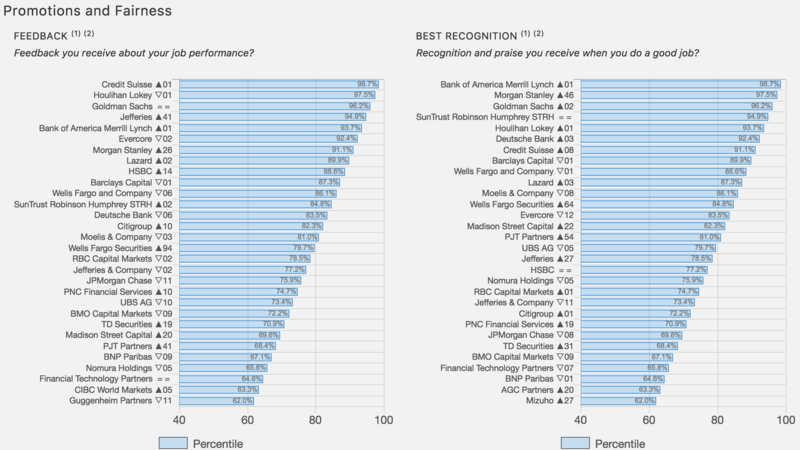 Goldman Sachs, Bank of America/Merrill Lynch and Lazard earn the top honors for “proudest employees” while Goldman Sachs, Bank of America/Merrill Lynch and Houlihan Lokey round out the top three for their firms being “recommended” to others by their employees. Notably, Evercore wasn’t in the top three in either sub-category this year but was in the top two of both sub-categories in 2016. This is likely because Evercore hasn’t been getting much press over the past year, but should revert soon since it still has strong deal flow. Key Observation 6: Top senior management rankings have had strong volatility since 2014. The senior management statistics were generated from the following four sub-categories. We’ve highlighted the top three out of 79 firms in each sub-category. Do you see what we see? The data suggests a strong correlation between opinions about senior management and the company’s performance in all other categories throughout the investment banking reports. These rankings have had strong volatility since 2014. But once again, it is interesting to see Wells Fargo maintain its strong senior management reports (since 2014) - considering the highly-publicized scandal. It will be interesting to see next year’s report to understand if the scandal’s fallout will affect these perceptions. Key Observation 7: None of the top-ranked lifestyle firms are in the top 10 for most average hours worked per week. The 2017 Investment Banking Reports also include respondents’ opinions on which firms provide the most satisfying lifestyle as defined by three sub-categories. The top firms in each sub-category are listed below. The data suggests that Wells Fargo Securities employees appreciate the lifestyle provided by the investment bank as evidenced by a top-three statistics out of 79 firms in the two “positive” lifestyle categories. But, as mentioned in the other areas - this will be important to monitor going forward. Top performers in other categories highlighted in this article round out the rest of the top three. A striking takeaway is that none of the top performing firms in previously discussed categories, including compensation, are in the top ten of 140 companies for most average hours worked. In addition to the main categories discussed throughout this article, there are several other points of interest. The greatest number of submissions came from employees at top-ranked firms throughout the 2017 Investment Banking Reports. Level of education also played a role with 58% of the report’s 33,400 unique contributors citing a GPA between 3.5-4.0. The 2017 Investment Banking Reports provide key insights into the industry as well as important information for both employers and current/potential employees. Analyzing the data in each category is useful when determining priorities in your job search. For more information, including the most current data as reports are continually updated online, please contact Wall Street Oasis at [email protected]. ha, facebook or uber software engineers make 75k. BS. It was very informative. Thanks a lot for sharing such an important information. there's a ***ton of posts on this. google dude. I find it interesting that Yale and Princeton are not on the top 10 most targeted universities. Perhaps because unless you have a scholarship it is often the very wealthy that go to those schools. Somebody who grew up affluent may not have the desire to work 100 hour weeks in an investment bank, or the drive to not want to be poor any longer. Thanks for sharing this information, it is very useful information.